Oxygen saturation can be measured using a pulse oximetry device, which is a non-invasive method to measure arterial oxygen saturation level. See Figure 4.1 for a pulse oximeter. In critically ill clients, a more invasive and continuous monitoring system is used to measure arterial blood gases through an arterial line. An arterial line is a catheter that is inserted into an artery, usually the radial artery. It provides a way to access blood gases including arterial oxygen saturation (SaO2). 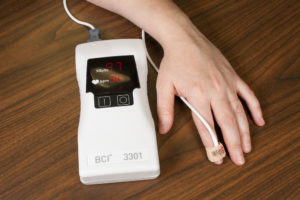 Here, we focus on pulse oximetry because it is identified as a vital sign. 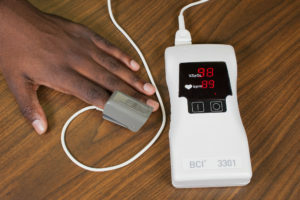 A pulse oximetry device includes a sensor that measures light absorption of hemoglobin and represents arterial SpO2 (OER #1). Oxyhemoglobin and unoxygenated hemoglobin absorb light differently. The sensor measures “the relative amount of light absorbed by oxyhemoglobin and unoxygenated (reduced) hemoglobin” and compares the amount of “light emitted to light absorbed” (Jarvis, 2014, p. 164). This comparison is then converted to a ratio and is expressed as a percentage of Sp02. A pulse oximeter reading reflects arterial oxygen saturation levels, as opposed to venous oxygen saturation levels, because the device only measures light absorption of pulsatile flow: the ‘p’ in Sp02 refers to pulse or pulsatile flow. If pulsatile flow is limited or obstructed, an oxygen saturation level will not be accurate. For example, the compression of a blood pressure cuff will obliterate the pulsatile flow so blood pressure and pulse oximetry should not be taken simultaneously on the same limb. The sensor is attached using various devices. One is a spring-loaded clip attached to a finger or toe as shown in Figure 4.1. It is used when an intermittent measurement is required. However, this clip is too large for newborns and young children, so for this population, the sensor is taped to a finger or toe. See Figure 4.2. This technique is also used for clients who require continuous monitoring. An earlobe clip is another useful device for clients who cannot tolerate the finger or toe clip or have a condition that could affect the results, such as vasoconstriction and poor peripheral perfusion. 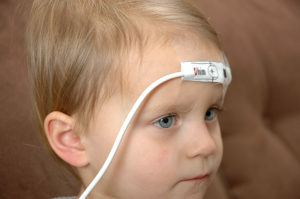 Another type of device is taped across the forehead and left in place for continuous monitoring. See Figure 4.3. Previous: What is Oxygen Saturation? Next: What are Normal Oxygen Saturation Levels? How is Oxygen Saturation Measured? by Ryerson University is licensed under a Creative Commons Attribution 4.0 International License, except where otherwise noted.